Do you know the source of your struggles and stress? What if our dissatisfaction originates within ourselves rather than external circumstances? And what if the way to end suffering is to go on the inner journey of self-exploration – together? Certified Professional Coach, NVC Facilitator, long-time mindfulness, meditation and yoga practitioner, Barbara blends her extensive training in NVC, Nonviolent Communication, an awareness practice, together with her passion for self-inquiry. Her key mentors include Eckhart Tolle, Byron Katie, and Marshall Rosenberg. Barbara is currently a student of Interpersonal Neurobiology, attachment theory and trauma healing. All this inspires her passion to share the journey of transforming ourselves, our relationships, and the world we live in. “Here’s the deal. The human soul doesn’t want to be advised or fixed or saved. It simply wants to be witnessed — to be seen, heard and companioned exactly as it is.” ~ Parker Palmer in his article, The Gift of Presence, The Perils of Advice. 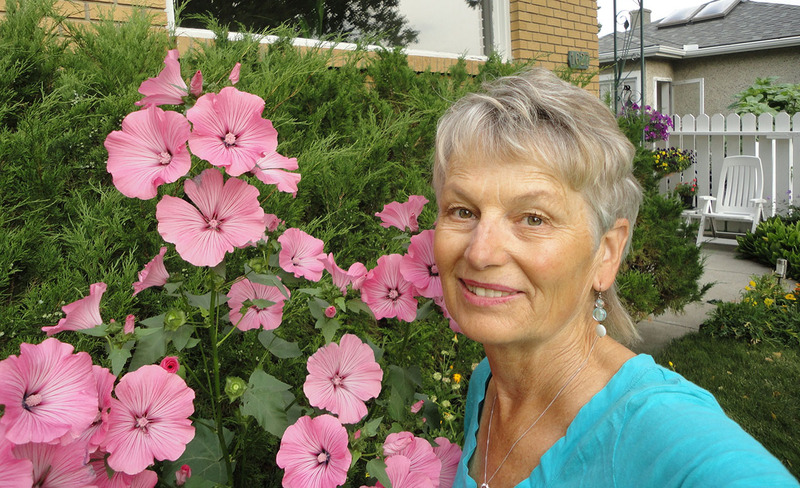 Barbara enjoying her summer flowers… Let’s grow and blossom together! “I truly feel energized and empowered in my relationships since coaching with you, Barbara. I’m thankful that you are supporting me in my journey of healing for myself and my family.” ~ Christina M.